James Neiss/staff photographerNiagara Falls, NY - UB OrthoCare opens at Summit Healthplex was made possible with a collaboration between UB Orthopaedics & Sports Medicine and Niagara Falls Memorial Medical Center. 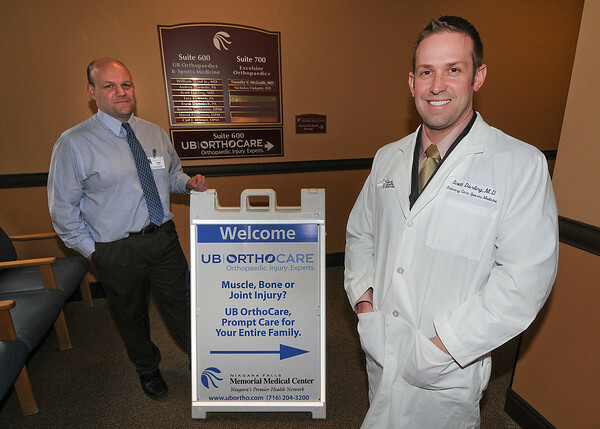 UB OrthoCare was established specifically for the treatment of muscle, bone and joint injuries within 72 hours of when those injuries occur, according to a press release. Here, Director of Sports Medicine Tony Surace, left, and Dr. Scott Darling, right, at the entrance to their offices.